I'm really happy to be promoting this particular book because I think it is a really helpful resource for families as they approach the Bible. 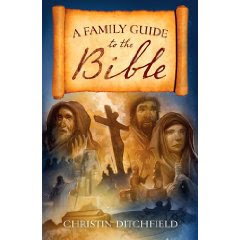 One of the newer additions to the Crossway line of books, A Family Guide to the Bible is worth looking into. The book is due to be released in May 2009 so it's pretty much hot off the presses, folks. This book is laid out in a simple and straight forward manner. It is made for lay people making it approachable and user friendly. Ditchfield begins the book by talking about the history of the Bible and where it came from. She talks about the time frame in which it was written and also briefly talks about the first church counsels who first met to establish the Biblical canon, explaining why some books were not included in the Bible. She moves on to talking about the authority which the Bible has and why we know we can trust it. Slowly but steadily she moves the reader along to the message of the Bible. The second section of A Family Guide to the Bible takes a look at each individual book of the Bible, from the Old to New Testaments. There are probably an average of 3-4 pages devoted to each book of the Bible. Within those 3-4 pages, Ditchfield names the book, the author, the audience to whom it was initially written, the setting and gives you a basic overview of the story. She shares the key message being communicated, a key verse, and defines and addresses words which may be unfamiliar to the modern reader. She is both simple and complex in her method of making the Bible approachable for the modern family unit who want to grow in their knowledge and understanding of God's Word. I really think she's done a fantastic job putting this project together! The book concludes by offering some tips from choosing a translation to study to how to approach family devotionals. There are maps included for easy sight reference as well as scripture references to memorize relating to various subjects from verses on how how to celebrate holidays to verses on Heaven. It's a comprehensive book that isn't scary or foreboding in the least. On the contrary, it's helpful, exact, and accommodating. Definitely worth owning! Crossway Books has graciously and very generously offered to give away FIVE copies of this book to some Reading to Know readers. If you would like to win a copy of this book, leave me a comment below with a valid e-mail address so that I can contact you when the winners have been selected. U.S. Residents only please. Regardless of whether or not you win this contest, I heartily recommend that you look into this great family resource. It's a good thing to have on hand! I always debate entering myself for "family" books like this, since, as a single woman, I might be taking the giveaway from a family who can REALLY use it. But this one sounds like a great book to peruse, note, and pass along to another family. This book looks like a great resource for our family! This looks fantastic. Please enter me! Thanks, Carrie. I would love to win this book. It would be great for our family. Thanks for the giveaway. This looks fabulous, Carrie! Sign me up! We are tying as a family to do more of the right thing spiritually. This would help. thanks. Sounds like a great book. Please count me in! Thanks. This looks like a wonderful book for my family! Always looking for something user-friendly that I can share with my children. My 9-yr old daughter especially has been having more religious questions lately, and this would probably come in very handy in answering them! Our family could really use this. Anything helps to bring the family closer to God. Thanks! This looks like it would be helpful for my teaching! This would be great to have for our family!! I could definitely use this. Thank you for the chance. If I do not win this, I will look into this. Thanks so much for offering this! This would be a great book to have for my family. Thanks.